A few months back I said I wasn’t going to write about picturebooks anymore. I planned to post about the chapter books Cora and I have been reading together but then life got in the way and I haven’t taken the time to write about Harry Potter, My Side of the Mountain, or Bone. In the meantime, my friend Amy and I submit a proposal about picturebooks for the 2018 National Art Education Association convention, our local children’s bookstore – Cover to Cover (Columbus, OH) – announced they are changing owners and moving out of the neighborhood, and Cora started reading on her own. 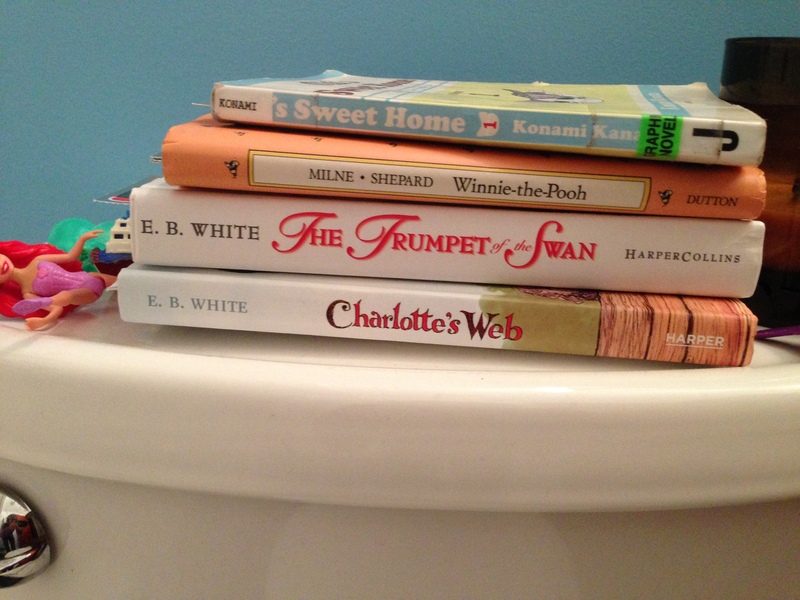 All this brings me back, happily, to share my thoughts on the stack of Mo Willems books currently perched on our potty. When I first read Willems Don’t Let the Pigeon Drive the Bus I couldn’t understand what so many people, including those who award the Caldecott Medal, saw in it. It seemed to me, frankly, a stupid story with lackluster illustrations. Then came Willems’ Elephant and Piggie books, first introduced to me during a read aloud in Cora’s preschool classroom. Her teacher had purchased a copy of the then newly released Thank You Book which was to be the final of 25 books about Gerald and Piggie. I couldn’t understand the appeal. Again the story seemed weak and the illustrations overly simplistic and uninspiring. Then came kindergarten. Cora’s teacher used Elephant and Piggie throughout the year: They listened to the stories during read aloud. The kids drew copies of the book covers and arranged them in a timeline based on when they were published. And they read from them in a readers’ theater at the end of school celebration, demonstrating work they’d done on their reading, intonation, and collaborative storytelling skills. My heart melted as Cora and her classmate read the book they’d chosen to a group of kids and parents. She was reading! Out loud in front of a crowd! All of a sudden Piggie and Gerald didn’t seem so bad. The next time we went to the library we sought them out. We brought a few home and Cora asked me to read them with her, taking turns reading different parts. It was fun and it was her choice. She wanted to read unlike so many other times I had tried to coax her to practice with me in the past. Parents of young readers know it’s hard to find books on the level that your child is reading. Each publisher seems to have a different labeling system and none seem quite accurate. But Piggie and Gerald really are great first readers. They have simple sentences made up of words that are easy to sound out. They have repetition. They are silly in all the ways kids recognize as silly. But I’m still not enthralled with Piggie and Gerald as art objects. They seem to be some other thing, something overly instrumental in comparison with the books I’ve written about before in this space. While some of those had instrumental value, they also took aesthetics into primary consideration. I don’t see that in Elephant and Piggie. The challenge for me is that my goal is to be funny, but within the constraint of using only about forty to fifty words…That’s why I say that early readers are hard writers—writing them isn’t easy….I sometimes joke that I write for functional illiterates…Because these stories aren’t meant to be read once—they’re meant to be read a thousand times. In that way, they’re more like a song than like the score for a film. You don’t listen to ‘A Boy Named Sue’ for the ending. I’m still want to know more about Willems relation to Piggie and Gerald. Were they just money makers in the end or did he dream of lives for these characters outside the pages of their books? What has he said about his illustrational style in these books? Whom and what did he look to for inspiration for these books? I’m interested to learn more and welcome links in the comments to interviews with or discussions of Elephant and Piggie you may have read. In the meantime, Thank you Mr. Willems. Thank you Miss Maureen. Together you got Cora reading to herself (on and off the potty). I’m so proud! Last summer I met Nancy McKibben when she was assigned to write a story about my urban farming project – Over the Fence Urban Farm. During our time together for interviews, Nancy and I shared our mutual interest in picturebooks and she shared her plans to put together an ABC book made of postcards, for children to create with the help of loved ones far away. In the fall Nancy sent me an invitation to support Kitschy Cat Alphabet Book on Kickstarter. (It’s now available on Etsy.) With a four-year-old at home in Ohio and family all over the country, there was no reason to refuse. For my donation towards the project’s start-up costs, I received the full set of postcards. 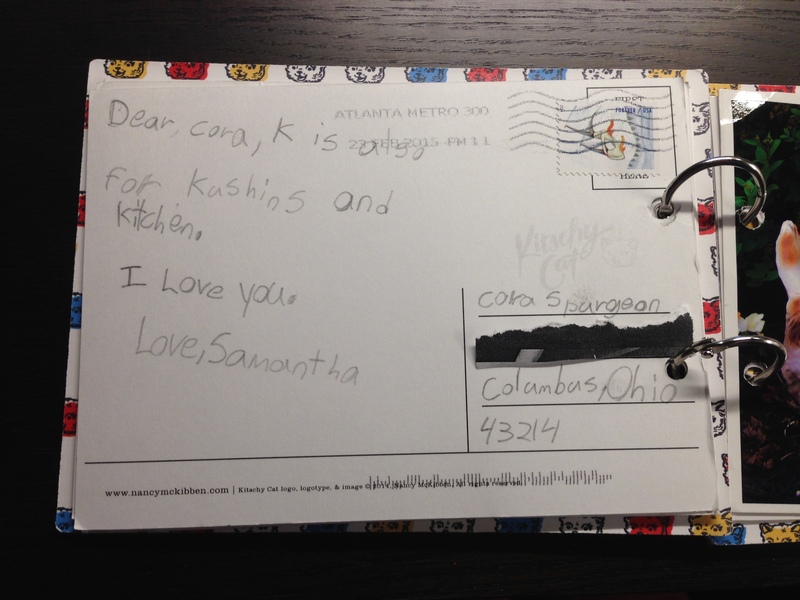 I love perpetuating the idea of snail mail, and am trying to give Cora ample exposure to the joys of writing and receiving handwritten notes. I think it’s catching on. And why shouldn’t it. There’s little more magical than sealing an envelop, sticking it in a box, and then receiving a letter from the recipient in response. 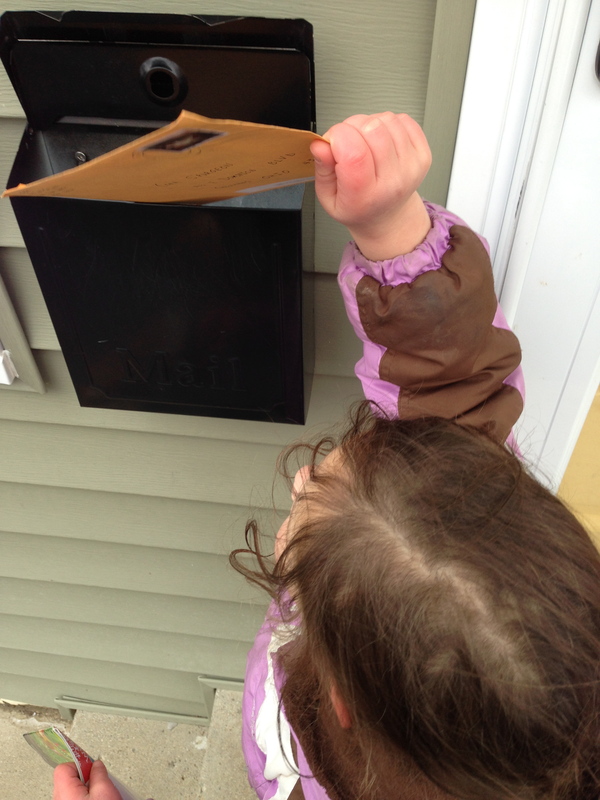 One of the projects on my to do list this spring is to create a mail station for Cora per recommendations from Playful Learning. Kitschy Cat will have a special place in the setup. I sent the postcards to my mom along with 52 stamps and the introductory note Nancy included for participants and then we waited. Mom let me know when the package arrived, told me I didn’t have to send the stamps, and proceeded to laugh as she apologized in advance if somewhere along the line she forgets about the whole thing. But then the postcards started coming. And her notes are thoughtful and clever! I love that she is referencing where she lives, asking about where we are, telling stories from the past, and making suggestions for the future. 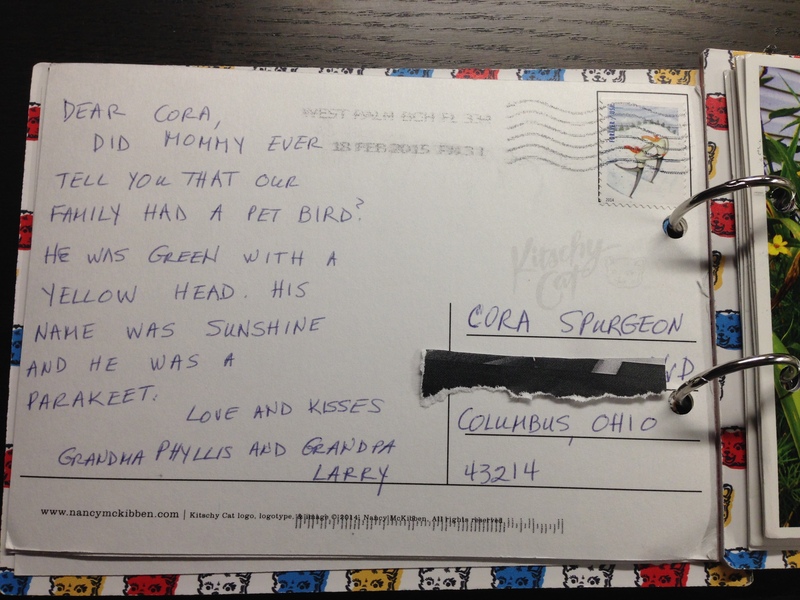 Previously, when I asked my mom to write to Cora it didn’t always happen. No shame, no blame. She’s just not that kind of grandma. The point is that the parameters and creative starts offered by the alphabet themed cards gave her the encouragement and support she needed. 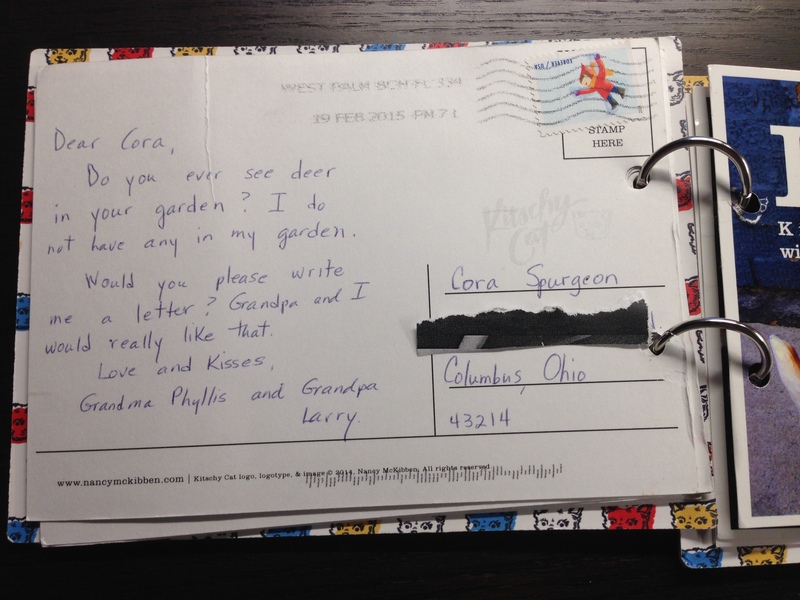 Suddenly I was seeing this as a creative invitation for my mom, perhaps even more than for Cora. Of course we’re trying to find ways to extend the activity on our end. Using the letter of the day as a prompt for writing practice. . .
And drawing invitations. . . In addition to my mom, I’ve been trying for what seems like forever to get my niece, who is in first grade and has the sweetest penmanship, to write to me with little effect. But my mother brought some Kitschy Cat cards along last week while she was visiting my brother and his family last week and guess who signed the last two letters we received? I’m grateful to Nancy for sharing this project with us. For me, it’s turning out to be so much more than the sum of it’s parts. I’m not sure what we’ll do when it’s over. As I dropped yet another unread novel into the return bin at the library this morning, it occurred to me that this column is three years old. I started it after writing for what seemed like the billionth time on some social media profile that the last book I read was a picturebook not some New York Times bestseller for grown-ups or Oprah reading club suggestion. Time flies when you’re raising a little one. But some things don’t change that quickly. I’m still sharing the bulk of my leisure reading time with Cora. However, what we’re reading is starting to change. For her 4th birthday, my aunt sent Cora a bunch of books including two chapter books, both by E.B. White. 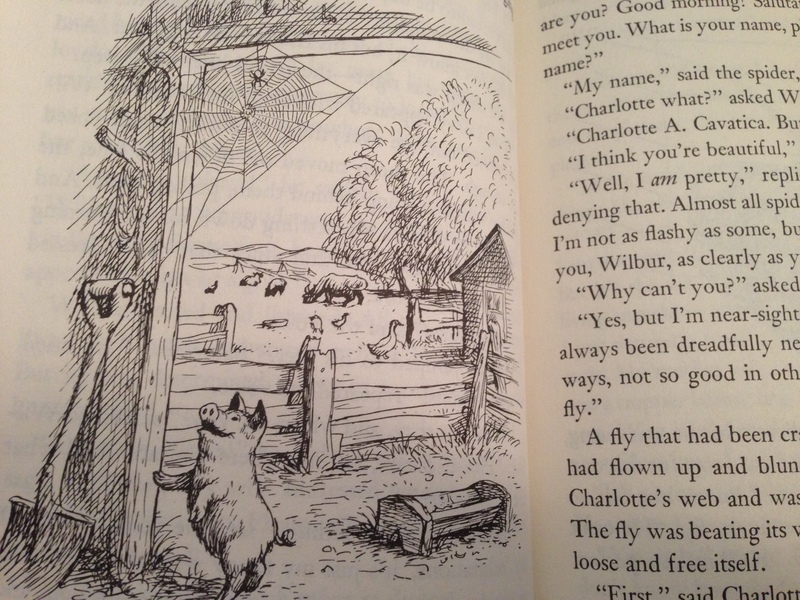 I read Charlotte’s Web when I was a kid. The Trumpet of the Swan was new to me. Both are great stories that demonstrate White’s love and respect for animals of all kinds. Cora listened to them intently, back-to-back. A few months later, after a journey into The Secret Garden, we’re rereading them again, simultaneously. Per Cora’s request, we read a chapter in one, then a chapter from the other. She’s picking up on similarities in the story lines and reminding me of things that will happen a few chapters down the road. It’s amazing to see how she’s soaking it all up. For now, Cora still looks forward to the pages in the chapter books with illustrations. I can remember than feeling. And not just from when I was practicing reading and a page with a picture meant fewer words I had to struggle through. The pictures helped me see the rest of the description more vividly. Some would say they were a crutch, that White’s writing doesn’t need images. I guess I think of them more like training wheels, bolstering young readers as they embark on new reading challenges, in this case, reading stories of more than 200 pages. As we embark on the third volume of this column, be prepared to see a shift in some of the content. I still plan to write primarily about picturebooks, but there’s likely to be some graphic novels and illustrated chapter books in the mix as well. Regardless, I hope to keep thinking about the role books with pictures play in creative and intellectual development. This subject of this issue of Picturebooks on the Potty – Goldie Blox and the Spinning Machine – is one part book, one part educational toy, and one part girl power battle cry. The book tells the story of a girl named Goldie who builds a machine to spin her toys modeled after the ballerina in her music box. The goal: Get more girls to see science, technology, engineering, and math as arenas for creative play, exploration, and potential careers. To be honest, The Spinning Machine wouldn’t have made this column as a stand alone picturebook. The story just isn’t that captivating. 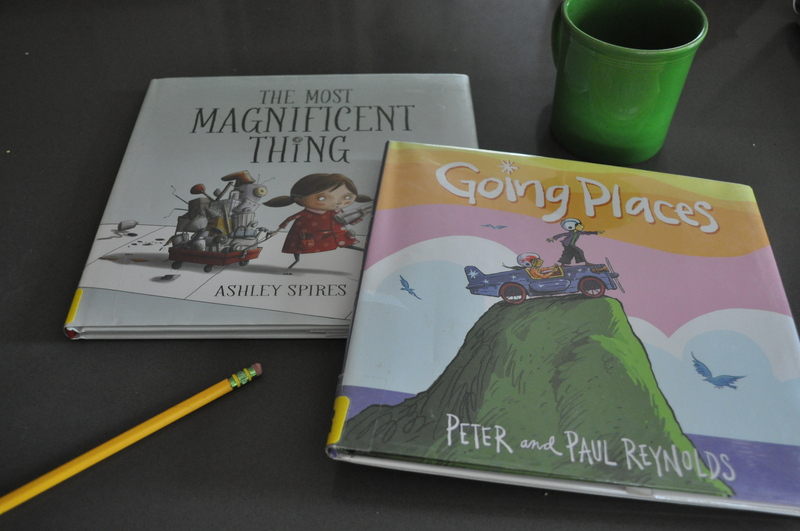 (You can find some of my recommendations for picturebooks about kids who build stuff here and here.) What Goldie Blox does that these other books don’t, however, is provide materials for readers to build alongside Goldie. This is good news for parents as well as kids. No pressure to gather supplies and mine Pinterest for DIY project ideas. Our kids, boys included, can start tinkering immediately. 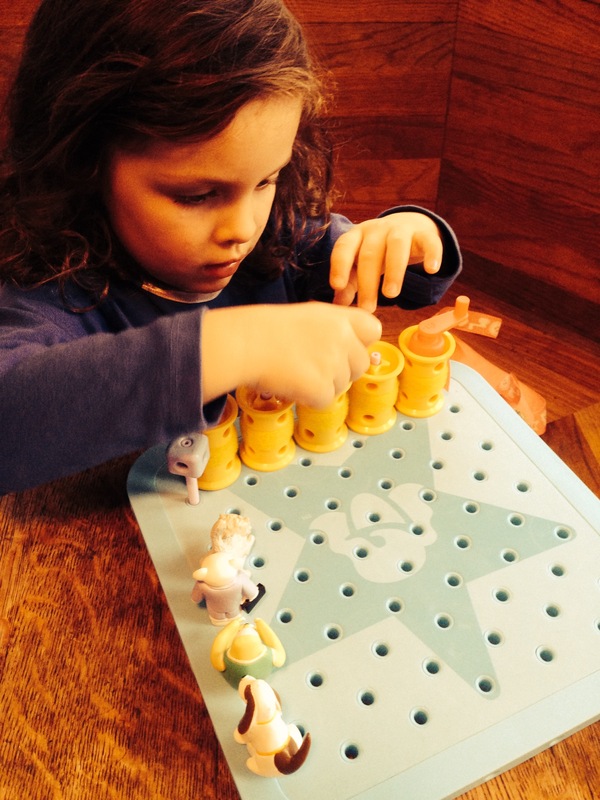 But girls are the primary audience for Goldie Blox. Combining their love of storytelling with all kids’ tendency to come up with new ways to play with their toys, the makers hope to reach millions of girls who are would-be engineers but, “just might not know it yet.” After only one reading, Crafty Cora has spent hours playing independently with the peg board, washers, axels, spools, blox, and snap-on figurines that came with the book. She has set the parts up in various configurations and made up scenarios for each scene. 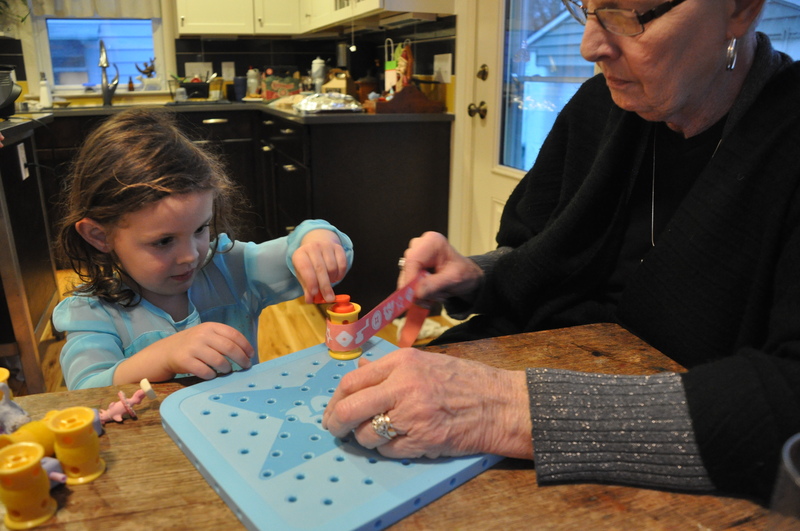 Cora wasn’t the only girl around here excited about Goldie Blox. Her older sister, grandmother, aunt, and I have all spent time messing around with the kit. In this way it’s been a cross-generational activity, one which each participant approaches a bit differently, thus demonstrating that there’s more than one way to spin a sloth. As far as I’m concerned, Goldie Blox has already earned her keep. Still, I’m eager to see what else she might inspire. So many of my students are doing exciting work these days that could be categorized as STEAM-based; education inspired by intersections of science, technology, engineering, art, and mathematics. They are interested in maker culture, functional folks art traditions, and D.I.Y. aesthetics. I’m naturally drawn to their ideas as so many fall outside the traditional bounds of our field. In the very the near future I hope to share more thoughts and resources on this topic. Today I have a few new picturebooks to share that capture the spirit of the maker movement and STEAM-based education. Art educators who work with students around 9 years old and older often struggle to get them to try work through challenges they face in the studio. By this age kids have started to develop a sense of who is “good and art” and who isn’t. Two books by author/illustrator Peter Reynolds have been widely used over the past decade to encourage all students to see themselves as capable artists – Ish (2004) and The Dot (2003). Both books present definitions of what counts as art that defy traditional, representational definitions. They speak to the intention of invention and experimentation of artists; to a love of observation and media exploration. Reynold’s latest title Going Places (2014) takes this concept one step further and challenges readers to consider new ways of approaching projects that seem to have finite conclusions. It is an invitation to question the rules and think differently. In the end, the main characters work together to come up with an idea better than either could have come up with on their own. The book reads like a PSA for The Partnership for 21st Century Skills, an organization which promotes creativity, critical thinking, communication, and collaboration as key skills for living and working in society today. (While I thought this was merely a coincidence, it turns out there is a real connection between the two.) All too often picturebooks written with a particular message in mind are dull and boring but Reynolds has proven, once again, that it is possible to capture our hearts and minds all at once. Depending on your educational worldview, it may seem contradictory to hear a professional educator say she’s not sure she wants to send her kid to school. But I’m not. I don’t want Cora to waste her time in a classroom being prepped for tests. I don’t want her sitting through classroom management nightmares. And I definitely don’t want her eating in a school cafeteria. I’m sure I’d feel differently if she were going to attend some fabulous private school where teachers still have intellectual freedom, where parents are paying so much tuition kids wouldn’t dare make a nuisance of themselves, and where all the food is organic and locally-sourced. But that’s not the reality we are living in. We live within the bounds of a large urban school district with its attendant challenges, and a few assets like a nice range of specialized schools. I’m not sure I’m ready to be a full-time homeschooler either. I have long argued that all parents must think of themselves as homeschoolers to some extent. Children just aren’t in school enough hours of their lives to leave their education completely up to school teachers. But I’m not sure I’m up to the task of teaching Cora everything she’ll need to learn. I could join a homeschooling co-op, but I haven’t been having the greatest luck lately with volunteer-led organizations. And, truth be told, part of me would welcome 5-6 hours of time to myself everyday. 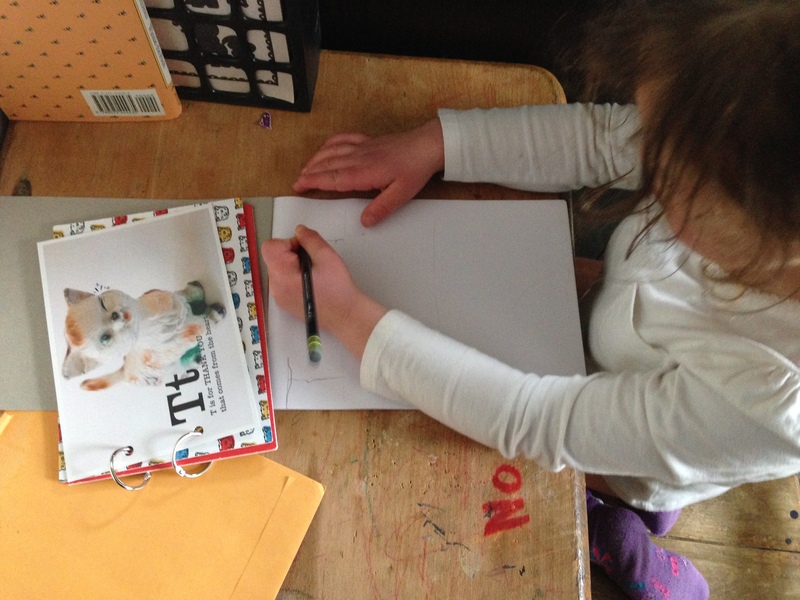 As a kind of experiment, we’re trying out a homeschool preschool curriculum designed for the summer months by the mother-daughter team behind the blog Wee Folk Art. My friend Melissa (who plans to homeschool her daughter Maya, Cora’s best gal pal) recommended the program and upon initial investigation, I find it pretty well-thought out. 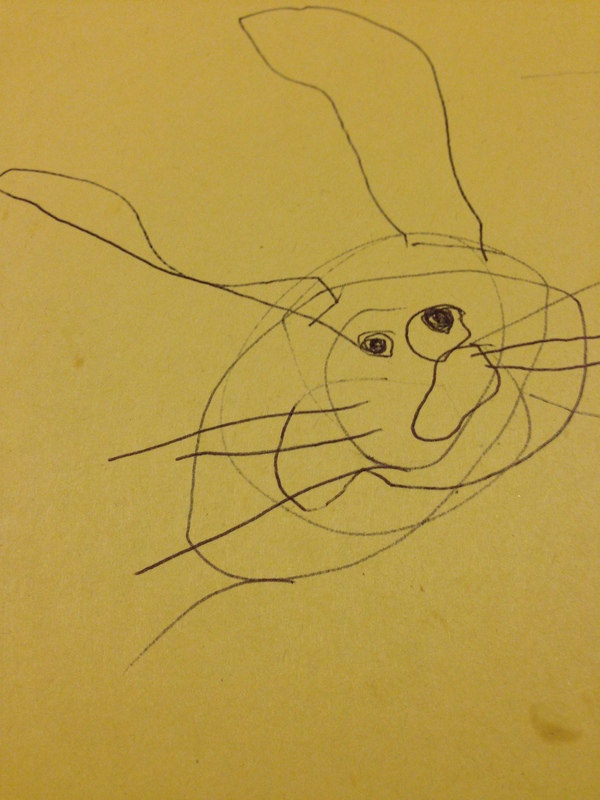 They authors draw on their backgrounds in education (mother), the arts (daughter) and parenting (both). So far, the summer unit “Puddles and Ponds” seems age-appropriate, open-ended, and engaging. 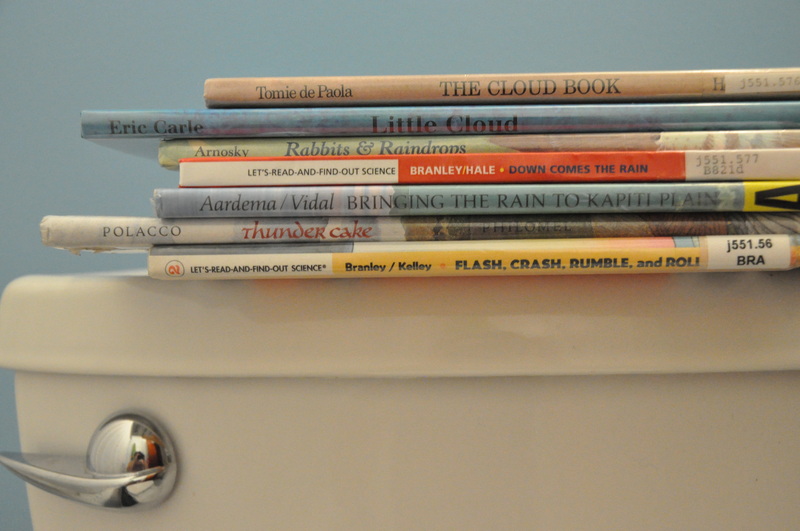 Regular readers of this blog, and “Picturebooks on the Potty” specifically, will not be surprised to learn that one of the things I like best about the curriculum is the use of picturebooks as a foundation for each lesson. Cora and I are having a bit of trouble sticking to just two books a week, but after just a few days she’s already applying information from them to her observations in the real world. The first two books we read were about clouds – The Cloud Book (de Paola, 1975) and Little Cloud (Carle, 1996). 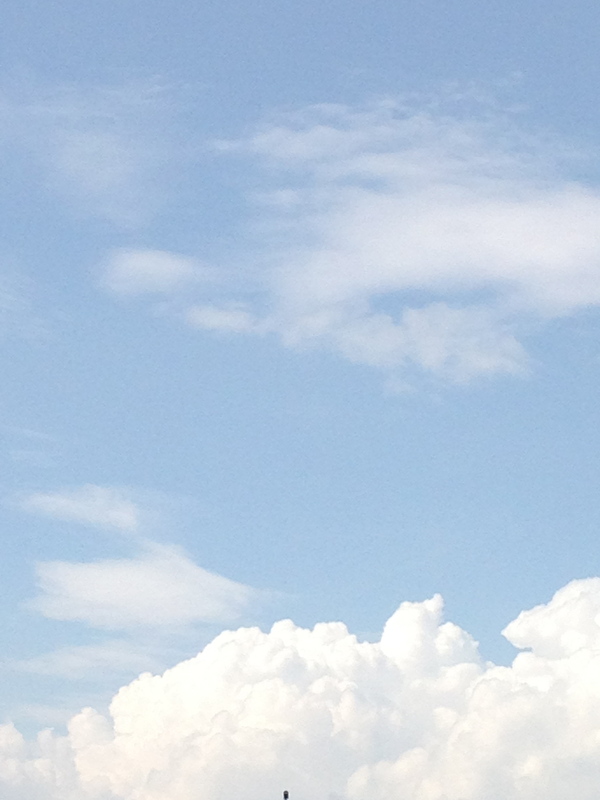 I don’t remember learning about clouds. I’m sure I did 30+ years ago but I’ve enjoyed this chance to reengage the terms and the science behind them. This afternoon, on a VERY long drive to pick George up from camp and drop him at a friend’s house (my least favorite type drive, the kind that makes me feel most like a taxi driver), Cora looked out the window and commented on the clouds. For the rest of the ride we talked about what we saw – wispy cirrus and fluffy cumulus clouds to the north, altocumulus in the distance to the east, and finally nimbostratus as a storm blew in from the south on our way back home. It almost made the drive seem worthwhile.